Skipper Sam Davies and her Team SCA crew struck a resounding blow for women’s sailing in the early hours of Thursday morning when they clinched leg 8 of the Volvo Ocean Race between Lisbon and Lorient, France. The culmination of over two years of hard work came together at 0211 UTC as they crossed the finish line after 3 days 13 hours 11 minutes and 11 seconds to take their first Volvo Ocean Race leg win. The overall leg win was the first by an all-female team ever in the race, although Tracy Edwards and her ground breaking Maiden campaign during the 1989-90 Whitbread Round the World Race clinched two leg wins in Class D of the 1989-90 race and paved the way for Team SCA's result on this leg. The 647-mile leg long leg was intense with a bit of everything, from light winds at the start to the brutal upwind conditions in the Bay of Biscay, conditions that saw several crew members hit hard with seasickness: “Sea sickness has taken its prisoners onboard. Luckily we were prepared for the Bay of Biscay. It has been 24 hours of endless bouncing around upwind. For some onboard it has been 24 hours of hell, a repetitive cycle of drinking, trying to eat, being sick, and trying again [but] the fact that we’re winning makes it all the more bearable,” commented Annie Lush from on board late last night. Team SCA led the fleet for more than half the leg and once in pole position, then dominated. A tactical decision to choose the more offshore course as they headed into the Bay of Biscay and forecasted 30+ knot upwind conditions paid dividends. The fleet split with four boats taking the inshore route, hugging the coastline. For Team SCA it was a case of being the hunted rather than the hunter and holding their position over the others. A jubilant skipper, Sam Davies, exclaimed: "Thanks to everybody for all your support. It's not really sunk in yet. It probably won't hit us until we hit the dock and we see there aren't any other boats there. It's a reward for all the hard work we have done. It's a great confidence booster. It's going to be huge for us. We've had a mountain to climb to get here." The performance of the team has been improving leg by leg, winning this leg silences some critics who have felt that all female team could not be competitive in this male-dominated fleet. “They were up there in performance with the guys but sometimes to do well, you need to sail well. 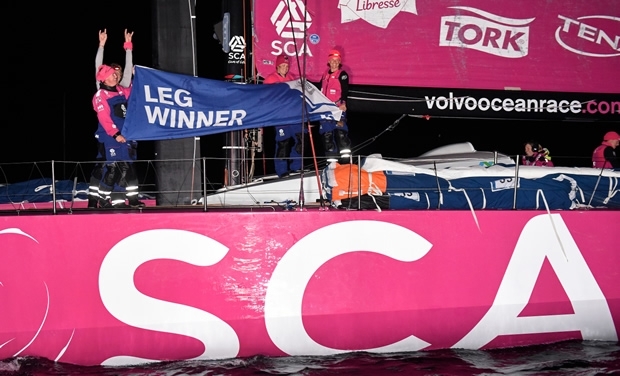 They were just missing a few bits and pieces and on this leg they got it right, and when you get it right, you win,” commented Team SCA Coach, Joca Signorini. Speaking dockside skipper Sam Davies said., "Thanks to everybody for all your support. It's a reward for all the hard work we have done. It's going to be huge for us. We've had a mountain to climb to get here. The conditions might have been man breaking, but they were not women breaking. It feels great to have held that lead in the conditions we had. It was not easy in the Bay of Biscay. But I am proud of how we sailed. It was pretty violent onboard - we had a tough 36 hours across there. If I chose one leg to win it would be this one coming into Lorient, so I am doubly happy." Behind Team SCA, the newly rebuilt Team Vestas Wind finished in second following their return to the race after six months out after the crew ran their boat on to an Indian Ocean reef during leg 2. Skipper Chris Nicholson said he had simply hoped that his boat could negotiate the leg without mishap and be competitive – a high podium finish was almost beyond his wildest dreams. "It's a very special moment," said the team's Onboard Reporter, Brian Carlin. Nipping at the Danish VO65's heeled was Abu Dhabi Ocean Racing, who's third place on this leg - significantally ahead of Team Brunel and Dongfeng Race Team - was enough to cause them to win the 2014-5 Volvo Ocean Race with a leg to space (more on this later no doubt).